8th August was such a day – witness to changing seasons – blessed with small raindrops. It was also the day when Nasscom Emergeout was happening at Gurgaon. I got an invite to attend, and decided to join. The conference venue was Leela Kempinski Gurgaon which stands next to the Delhi-Gurgaon Toll plaza. For me, a conference is less about condensed ‘gyaan’ and more about the little nuggets in the sessions. It is also about new connections and interesting discussions in hallways. My experience at Nasscom EMERGEOUT was no different. I went for connections and learning – and came back with both. Here is a brief account of who I met, what I heard and what I learnt. 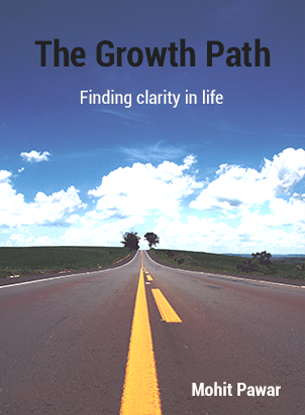 Reached early and one by one met – Abhinav Sahai, Anandan Pillai (Anand penned a brief key takeaways post, so if you are short on time go check it here [If you are looking for real crack stay here :)], Sairee Chahal, Jyoti Makhija, Siddartha Hegde and Rahul Dewan. We discussed about the details of the day and after a quick cup of tea – entered the hall for opening session. 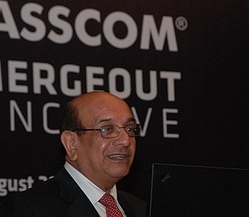 Som Mittal, President Nasscom opened the Conclave with “Welcome address and Opening remarks”. He talked about Indian tech companies is transition from the IT Services to solutions and now in the products space – and uncertainty across the global economy. He said, “What happens in the back doesn’t matter, what you deliver in front that matters.” message was clear -0 despite the chaos.. Indian IT companies and innovator needs to build and deliver quality and be remarkable. He also talked about mobile penetration being high and people using mobile phones everywhere. As per him digital literacy shows big promise. I agree. That is why I am betting big on this space with my new start-up. More on that in one of the future posts. For now let us stay at EMERGEOUT. He then, shared (good) news for small businesses struggling to provide insurance to their employees because of their small size. Now every Nasscom member co, however small could get insurance cover for its employees. Already 12,000 members are using this scheme. Inaugural session was hosted by Krishna Kumar Natarajan (from Mindtree) fondly known as KK. In this sessions Aditya Ghosh, Presdident – Indigo Airlines and Venky Mysore, CEO Kolkata Knight Riders (KKR) were to present. They did present and shared tons of little nuggets that I came for. KK started the sessions by talking the large untapped opportunity in mobility. He introduced Aditya as a lawyer turned entrepreneur. and that businesses can be built on simple ideas and passion. He joked that he is a lawyer who knows litle about tech and that because of being among geeks and tech entrepreneurs he brought his VP of Tech along – to answer any questions which he may not be able to answer. In his case the question was – Why start an airline? His reason – Opportunity – tons of it. In his words – India has a large, growing population with low aircraft penetration. US has 7,000 commercial aircraft for a much lower populations. Clearly there was room was a large carrier. So much so – that If aviation industry can convert 1% of train passengers ( to air – the industry will need to double the size – overnight. Then he talked about the origin of the company – which Started in 1989 as Interglobe Air Transport. Indigo Airlines stared in 2006. In June 2005, Aditya – 29-year old then – signed the largest ever order of 100 aircrafts with Airbus – worth 6.5 billion. Indigo started operations in 2006 and in March 2007 had 1 million passengers. In March 2012 – flew 35 million passengers with a fleet strengths of 55 planes. He then talked about creating a competitive advantage. He created it by taking lead in ordering planes in large numbers, before anyone else did. In Aditya’s (Indigo’s) case – competitors could only get their planes once the large order he placed is delivered. Low cost ≠ low quality. He is proud to be Low Cost Carrier (LCC) and wants to remain that way. As an LCC indigo is committed to provide – spotlessly clean interiors and widest variety of food. Interestingly, Indigo only spends 1% of its revenues on advertising. Whereas others airlines – his competitors – spend up t 11% of their revenues on advertising. That is one reason why Indigo is the only profitable airline in India. Product is the biggest differentiator for Indigo. 1 out of 4 air travelers in India fly Indigo. 60,000 customers a day fly Indigo. 180 passengers are deplaned in less than 6 minutes. It takes clockwork like precision. Turn around for every plane is 30 minutes. And there are 50% repeat customers – mostly because keeping the promise of on time. He laid emphasis on getting the basics right. Indigo for him stands for – Low fares. On time. Courteous hassle free service. Indigo achieves this by creating hassle free environment for employees (has been voted one of the best places to work for past many years). It has close to 6000 employees and the lowest number of employees per aircraft in the industry. For 50% of its employees aircraft is the office. They should feel connected and stay grounded to make it happen. Indigo does this by instilling the sense of ownership. Indigo does not give stock options. For them it is more about personal connection. Indigo flies to fewer destinations than competition. More Destinations are good for ego but bad for business. They are obsessed about ON-TIME and use technology for being transparent. In Aditya’s words – Indigo is the only airline in India that uses – AUTOMATED TRACKING SYSTEM to measure on-time performance (as per him other airlines uses manual system to report on-time – where it is possible to report a 10.12 am landing as 10.06 am landing. How Indigo is winning through innovation? and What is innovation? Everybody pays same fuel prices – then how to compete. Indigo is using the scale and fast decision making as competitive advantage. Innovation is to create unique structural advantages that can’t be copied for few years. 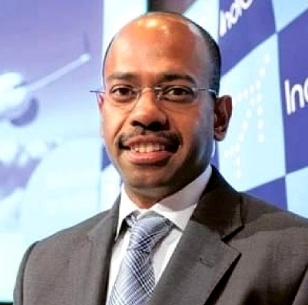 In Jan 2011 – to keep the competitive edge – Indigo placed a $15 billion order for a320 NEOs AIRBUS – which has better fuel efficiency In Aditya Ghosh’s words – we took risk by putting our money behind a new thing but also created an advantages. [If today a competitor places an order for an Airbus Neo – it will be delivered in 2021 (9 years later). Till then Indigo will pay same fuel prices – but will pay for less fuel. Interesting discussion during Q & A.
Q: How Indigo keeps costs low in a price sensitive business? Q: Should a company cut salaries to reduce costs? A: Indigo does not do it. It may work in very short term but very bad for employee morale and hence for company productivity. Venky Mysore, CEO KKR was up next. KK introduced him as someone who he plays golf with. Aditya (Ghosh) was all about numbers, simple business ideas and execution. Venky was less about numbers and more about emotions, planning, connections and discipline. He also personal experiences turned into insights, with a good dose of humour. Venky started talking about how he came from after spending years in US to India, starting working in Insurance and then his move to sports entertainment. “Ignorance is bliss” – came to be true in his case. He shared a small story. That he was born in a Madrasi family and despite having played for Madras University Cricket Team and Madras Ranji Trophy team – his Father pushed him to study – which he did and in the hindsight thought to be good decision. Soon after he moved to Mumbai from US, he became part of Young President Organization (YPO). Then as luck will have it, connected with Jay Mehta (better half of Juhi Chawla) and part owner of KKR. Soon he found himself at Shakrukh Khan’s home discussing about KKR. He said that KKR’s poor show in past 3 editions of IPL had made the owners tired and they let him roll in his style – which worked eventually. He chose to keep himself away from camera based on his wife’s advice. In his words, “I sticks to what she says”. He said that it is difficult to decipher a formula about success but if there was one in his case – it was passion, vision, preparation and execution. At this point he shared the story of CLIFF YOUNG, an Aussie farmer – who at 61 decided to run an ultra-marathon (1000 miles) trying to break a world record. He failed but next year (1983) attempted another world record (600 miles run between Sydney and Melbourne). Earlier in life, he has never trained for a marathon and his conditioning and preparation from running after cattle on his 2000 acres family farm – and continued work spells – lasting 2 to 3 nights without sleep. What is surprising is that he won the ultra-marathon – believe it or not – by a margin – of 1-1/2 day. Reason: the professional ultra marathoners – who are obviously very fit run for 18m hours and sleep for 6. But Cliff Young went on for days without sleep and this worked as a boon for him. 1. Not knowing about a new venture/space is OK. You can still do it. 2. It’s all in mind. Moving ahead, he shared a FORMULA. *Acting knowledge – learn enough to be the best you can. Venky Mysore is a big fan of MONEYBALL – the book which has been made into a movie of the same name. It is about decision making. 2. Preparation is very important. 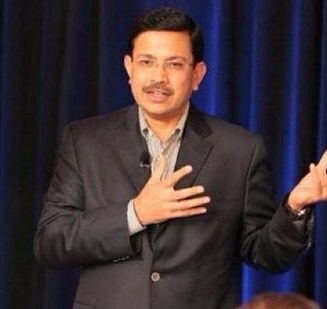 Venky hired a Chennai software firm to create bidding software and created lost of decision trees. Decided to bid for players around a player – not like 4 batsmen and 4 bowlers..
Did extensive research on players and asked advice about emerging stars who no one was noticing. decided on players and took risk and bid high and – spent $5 million of $9 million purse of for first 3 players. Because of the research KKR was able to hire — now star player f- or base price of $100,000 and $50,000. People like JAMES PATTERSON who now plays for South Africa – in all 3 forms. Realized that – with this he can’t make a promise to the fan or customer; because in sports it is not possible to win every match. A change was required – which he did. KKR’s promise – It’s about attitude (ZIDDI/ZID). We may fall down but we will get up again. 4. Show discipline to get others in groove. Venky shared that for an 8pm IPL match bus has to leave with players at 6.00pm. Shahrukh came to greet and hug players at after 6.00pm. Later when saw everybody reaching early he also starting coming at 6. 5. Relationships/ People are VERY Important. Before IPL finals KKR created a video with messages from the family members of all players of KKR and managed to show it at the team meeting. Voice over was by Shahrukh. Everyone was moved.. and this obviously crated as connect. 6. UNDERSTAND winners takes is all – 2nd place – no one remembers. Q: How did you mange ego with superstars in team? How did you make sure that stars didn’t outshine others? A: He said that they left some players because thought that they won’t fit in. When you have – QUIET LEADERS – like Jacques Kallis in team who are super humble even after being legends. When others see them they also behave. Before the break into there are a small ceremony to facilitate Emerge 50. Over tea I bumped into my friend Paras Chopra, and also briefly connected with Indus Khaitan and Prashant Singh. After tea break we went in for panel discussion. There was two concurrent panel discussions scheduled. I sat through the one focusing on CLOUD, didn’t like it much and moved into other panel discussion. This was titled The Tipping Point: The Big Business Decisions by successful new-age CEOs and how they made a difference. Following entrepreneurs were part of the panel. Suresh Sambandam,CEO – OrangeScape, were on stage. – Got acquired in 3 years – by Bertelsmann one of world’s largest media group. – Now known as fastest growing media company in the country. Ram’s reason to sell – we sold because I was not the only one involved but there were 40 other families (of NetworkPlay team members) also involved. At one point it was a make or break decision for Network Play – when they had 3 months of cash left – and LinkedIn has own its own entered into ad sales – then he reached out to adtech to become their partner for India. The deal took 7 months to come through. But network play was saved. Didn’t have access to capital then rode the dot com boom to land investment from Exodus founders. Focused on providing value and maximizing revenue per square feet (of data center). Later (2008 – 2009) entered into — INFRASTRCUTURE AS A SERVICE – and became India’s market leader. NTT acquired 74% stake in Netmagic. We used to have enterprise customers like Unilever paying 25 lakhs for a license then took a bet on going “platform as a service” on top on Google’s platform. For that we had to take short term hit in revenue – and rewrite 0.5 million lines of Java code into Python. This bet played big time. Organic growth is good but when you have repeatable short term cash flow.. it makes sense to acquire mind share and market share. Mr. Prakash Rane moderated the discussion and brought out interesting points to weave it all together. The discussion happened in bits and pieces but for reader’s benefit, I have noted it one by one for each speaker. His biggest challenges at Evernote was dealing with India’s culture. In India people call to understand how to use Evernote. Business for them comes through recommendations and word of mouth. 50-60k new users worldwide every day. 1500 in India every day. Evernote spends money on PR. Focus on creating a solid product. Once you create an extraordinary product with mass adoption, platform owners will do free advertising for you. He shared an example – If you walk into an Apple store you will see Evernote logo around – Evernote does not pay for it. For him, marketing begins with a great product. I agree. She shared the TutorVista story. Tutor Vista has 30,000 customers. Uses internet to acquire and deliver. All its customers are in US. US Market is large with – 60 million (K12) and 20 million (Higher Education) potential customers. Used PR to drive initial spikes and then SEO/SEM and UI iterations to hook consumers to its service. She also talked about putting eggs in different baskets. They have invested in Bigbasket.com – and are doing hyper local (BTL) marketing to promote it. Also into jewelry ecommerce with bluestone.com – and using celebrity marketing for it. 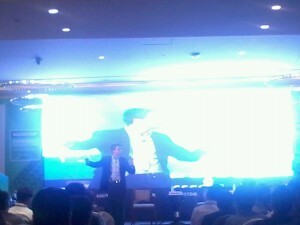 He talked about – building an Indian customer brand. Paid marketing is the easiest things to do. better to explore additional channels like building a brand through partnerships. Tie up with credit card companies and loyalty marketing companies. He also suggested doing A/B TESTING and SEO/SEM based on analysis. As per him, every company should focus on web analytics and business analytics. Revolved around – Life time-value of the customer. 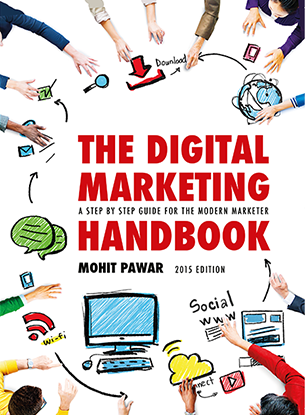 Q: How to find a good marketing channel? 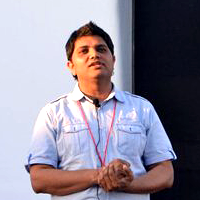 A: Manish Vij responded that find inspiration, and do what is working for others to begin. We reached part of the venue where tweet up was scheduled. Got to connect with Ajay Jain there and an interesting discussion came up – about PAY WHAT YOU WANT model. Along with Abhinav, Sid Hegde, Myself – couple of others tweeps also joined the discussion. Soon it was time for the next session of the day. Keynote by Google India MD, Rajan Anandan. He started with exciting Google glasses video. 3 Key insights with inputs from my friend Abhinav Sahai. SAAS products will be driven by great design. Video, bandwidth, video analytics, social, are the 4 trends to look out for in the future. IT services companies, go hire mobile app developers, says Anandan. India is a mobile-first country. He sees future of computing in use of visual computing and AI. It is not in customer feeding keyboard with data. He suggested the audience to build products that are friction-less. Next up was AppFame Awards Showcase. It recognized 6 apps. Details here. The one i liked was Game your Video. In his words – the answer was – because it is really easy to play with photos. Not so much with videos. The app “Game Your Video” is about solving the video problem. It makes video editing so easy that even a six-year-old can have fun editing videos and create very entertaining ones. The app brings users a totally new way of interaction while treating videos. The UI is innovative and the technology used is seen for the first time in the space of motion and audio. Then there was this guy who showcased TXTLater, for Blackberry users – it has got good press worldwide and has seen 1 million+ downloads. I stayed back for the unconference about “Finding your co-founder”. Rajaendra Pawar, Co-founder NIIT said that co-founders should complement each other and fill the gaps. He talked about his co-founder Vijay Thadani, who has a keen eye for finance and that he himself gets excited by looking at new things. Now after thirty years they can’t do without each other. One of the attendees Nalin Savara, said that your co-founder should also have same time horizon as you. If you are in it for the long haul then it helps that your co-founder think that way. Once it was I said goodbye to my new and old friends there. All in all an interesting day of learning and connections. All trademarks and rights with their respective owners. The core is – Indian teachers teaching US based students in an online environment. Couple of days back I spoke at a major education conference. Tons on ideas emerged there. Will share in a future post. Hope you will like it. 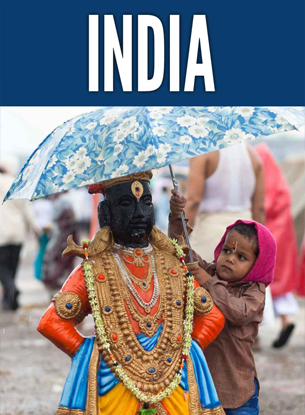 Reading about Indigo and KKR was such a pleasure…and too many takeaways. Comments like yours are a good motivation to go the extra mile – when one writes a behemoth of a post like this (3500+ words). Also thanks for your feedback earlier. A great summary to the whole conference in mere 3500 words. I loved reading it . lot of knowledge on technology and people associated with it. Previous post How to celebrate our freedom?